If your organization is exempt from the Texas sales tax it is very easy to make sure you are not charged sales tax on the FileTime service fee. You will need to provide to us a copy of your organization's Texas Sales and Reuse Tax Certificate before we can complete the process. Click Admin on the top navigation bar and then click Firm Info on the sub-navigation bar. 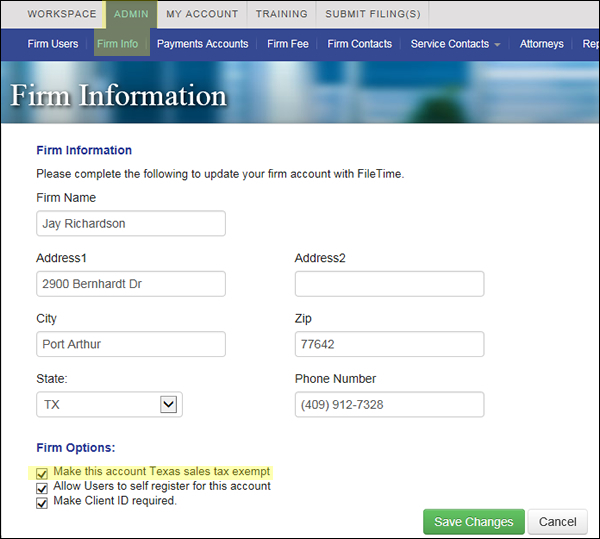 On the Firm Information page, click the Make this account sales tax exempt button. A window will open that enables you to upload your Texas sales tax exempt certificate. If you do not have it available now, click this window and you can send the form to us by email or by fax. Click the Select files button, navigate to where you have a copy of the certificate saved and double click it. The file will be uploaded to our site. You are returned to the Firm Information page. Click the Save Changes button and you are done. If you did not upload the sales tax exemption form we will contact you to provide it to us.